The combined Japanese picnic box is layered and split, and can be disassembled into three layers, double layers or single layers to help you sort the cooked food, raw food, cake dessert and fruit. The picnic is no longer messed up by food! 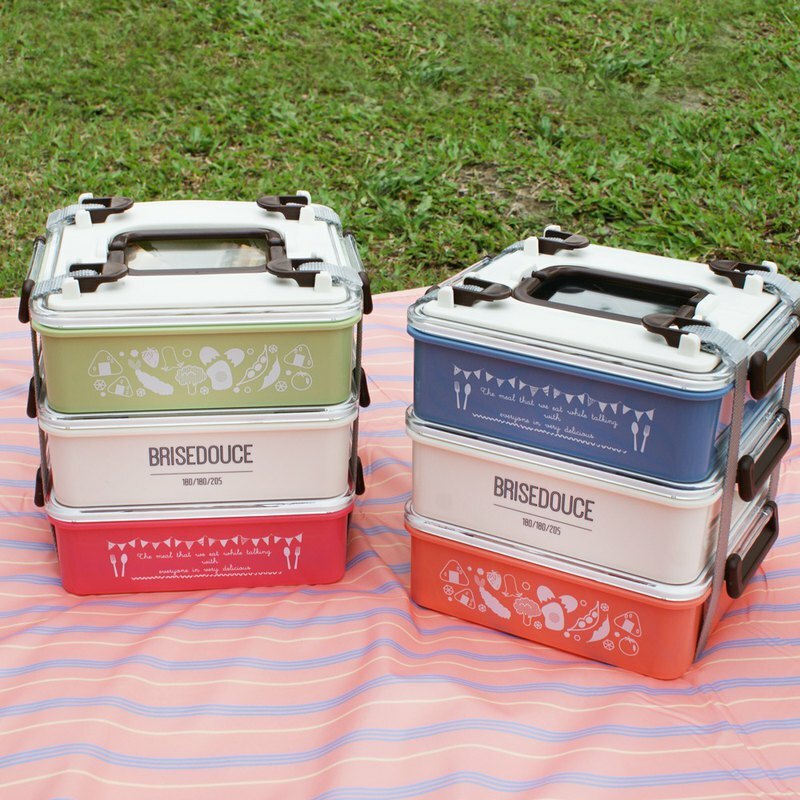 **[DESTINO STYLE] Japan BRISEDOUCE three-tier combination picnic box BRISEDOUCE Lunch Box 3 Steps** https://c1.staticflickr.com/1/934/42827414385_729fa59c83_c.jpg https://c1.staticflickr.com/1/850/43683769592_9d3aa0cbcc_c.jpg https://c1.staticflickr.com/1/938/42827414615_bd54b839ce_c.jpg Warm and hazy sunshine, green grass, fresh air, How long have you not been enjoying a nature feast? A rare holiday wants to go out with your favorite family and friends. The combined Japanese picnic box is layered and separated. Detachable into three layers, double layer or single layer freely matched, Help you sort out cooked food, raw food, cake desserts and fruits. Picnics are no longer messed up by food! /Features / - layered color separation, good food classification - Three-layer, two-layer, single-layer free use -Belt buckle design https://c2.staticflickr.com/2/1500/26274223716_8e71d95e65.jpg **The belt-type buckle design, as long as the belt length is slightly adjusted, can easily change the second floor into three layers, and the picnic is elegant and calm. ** /specification/ Size: W18 xD18 xH20.5cm Capacity: a grid of about 1.2L Contents: with lid lunch box x3 / handle cover x1/belt x2 Weight: 830g Material: Box - Polypropylene polypropylene, temperature resistant 140 ° C Cover - Polystyrene polystyrene, temperature resistant 70 ° C (Do not place directly on the stove, do not use the microwave oven, do not use the dishwasher to clean, please use a soft melon cloth and a neutral detergent to lightly brush, avoid the contents containing lemon or citrus peel oil or other may cause the container Deteriorated acid grease.) Place of Origin: Japan / style / https://c1.staticflickr.com/1/848/41922887990_8506645739_c.jpg **(left) red, white and green PK/GR K04-5159** **Blue and White Orange BL/OR K04-5160 (right)** https://c1.staticflickr.com/1/931/42927784744_cca44a0940_c.jpg ※ Due to the slight color difference of the product image, please refer to the actual product color.